A BACKCOUNTRY AVALANCHE WARNING has been issued through the National Weather Service for the Turnagain Pass area and surrounding mountains. Another round of rain, snow and wind will keep the avalanche danger pegged at HIGH again today. Large natural avalanches are expected at all elevations while this storm system persists. Travel is not recommended in avalanche terrain. If choosing to play in the flats, make sure to steer well clear of gullies and the bottom of steep slopes in the event an avalanche releases above you. Hiking in Portage Valley: Beware: avalanches occurring at the higher elevations can send large amounts of debris well into valley bottoms and cover snow-free hiking trails. Avoid trails that cross under avalanche paths. We are very sad to report there was a 4 year old girl from North Pole who died yesterday after being buried in a roof avalanche on Sunday. Our thoughts and sincere condolences are with the family and friends at this difficult time. The potential dangers of roof avalanches hits close to home for the CNFAIC. Jeff Nissman, one of the founding members of the CNFAIC, was killed in a roof avalanche in 2004. Please see yesterday's article by Craig Medred on roof designs, and a bit of history, HERE - it is very worth the read. Roof avalanches have been occurring over the past week in Girdwood due to warm temperatures and rain. Be aware that roofs will continue to shed with more rain today and into this coming week. Today we will see the brunt of the third storm to impact the area since March 27th. Winds are currently gale force from the East along ridgetops and .75-1" of rain has fallen overnight up to 1,000'. For snow, this equates to the higher elevations accumulating between 1-2+ feet; the mountain landscape will have a much different look when skies finally clear. Another spike in natural avalanche activity is expected today and paths that have already released may be reloading and release again. 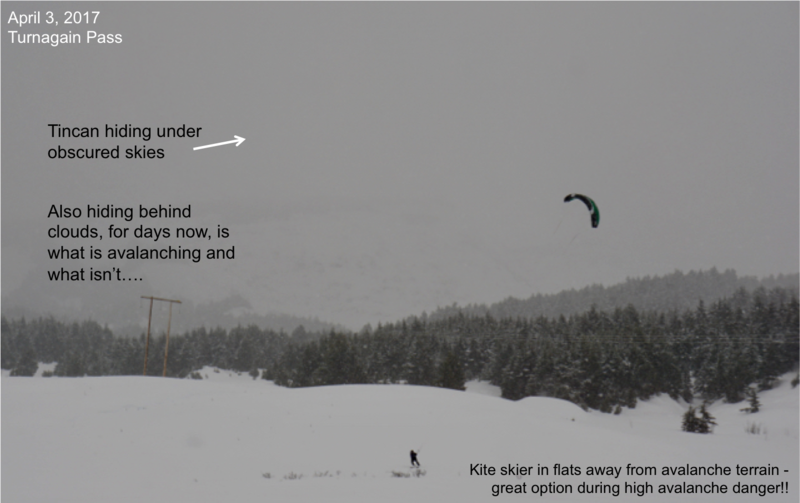 Storm snow avalanches may also step down into weak older layers in the pack, creating an even larger slide. Add warm temperatures and rain to the mix and there is no question, avalanche terrain should be avoided. Large amounts of debris are running to valley bottoms during this storm cycle. Thank you to Turner Pahl for sending in this photo from the north side of the Skookum Valley (just below the toe of the Skookum Glacier). 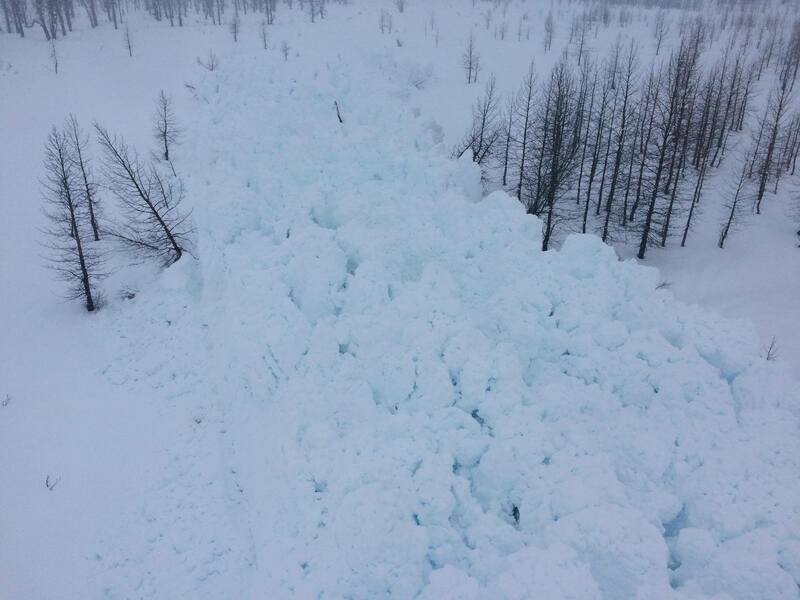 We are unsure of when this specific avalanche released but the photo was taken yesterday. Again, if choosing to brave the roads and parking lots and play in the flats, please remeber to stay well away from slopes and runout zones - debris can run further than you think during storms like this! The rain/snow line has climbed from near sea level yesterday to 1,000' overnight, possibly up to 1,500' in places. Although we already saw a widespread natural wet slab cycle at 1,500' on April 1st, we could see another one again today as another round of rain on snow is expected at the lower elevations. Hopefully the visibility will be good enough to see some of the action happening, but as is often the case, much goes unseen. Snow pit at 2,000' at Turnagain Pass on Sunburst, April 2nd. Note the wet layers up to 2,000', they only become wetter at the lower elevations where we are expecting wet avalanches. Prior to this storm cycle the snowpack consisted of many weak layers of facets and buried surface hoar. As mentioned above, avalanches releasing in the storm snow have the potential to 'step down' into old layers where snowpack tests are still showing propagation potential. Today's strong winds and precipitation are likely to tip in the balance in the upper elevations and we could see an avalanche breaking in the mid-pack or near the ground, with crown depths over 6' and running the entire length of a slide path. Obscured skies filled the region yesterday with light flurries and rain to 100' before the main portion of the storm moved in late in the day. Most of the action is from overnight when ridgetop winds picked up to the 40's and 50's mph with gusts in the 80's from the East. Over 1" of rain fell to 1,000' at Turnagain Pass with .75 in the Girdwood Valley. This equates to 1-2+' of snow at the upper elevations over the past 24-hours. Temperatures have been warm and fluctuating - sea level upper 30'sF, 2,000' the lower 30's F, ridgetops in the mid 20'sF. Today, we should see continued precipitation with .6" of rain below 1,000' and 6-10" of snow above 1,500'. Tonight another .25 of water is expected. The rain/snow line is tough to forecast and it could drop to 500' and even lower if colder air slides in. Ridgetop winds will remain strong in the 30's and up to 40mph from the East with higher gusts. Temperatures should remain warm, up to 40F at sea level, in the 30's at the middle elevations and 20's F along ridgelines. This storm looks to stall out and churn through tomorrow and into Thursday bringing continued, but lighter, precipitation and strong Easterly winds.